Baby and Mom. What a sight! Tomorrow, we'll be posting our "Year in Review" with photos and stories of special times we've experienced in this past amazing year of our world travels. This past year may prove to be our most memorable ever if there is such a thing. Every year has been over-the-top! Tonight we'll be celebrating as we bring in the New Year at Royal Kruger Lodge here in Marloth Park owned by JJ and Flo, a lovely couple we met through Louise and Danie at one of several Frikkie's Dam braai parties over this past year. Louise and Danie arranged ours and Rita and Gerhard's invitation and we won't be surprised to see that we already know many of the attendees from other social events in the park. As is the tradition in South Africa, we bring our own beverages, ice and at times, a dish to share. I made a low carb chicken, sausage, mushroom and cauliflower casserole which I'll bake ahead of time and cut into bite-sized squares. It may be served warm or at room temperature. There were dozens of zebras playfully carrying on in the parkland. Speaking of temperature, it was another hot night when the power went out for five hours during the night; no aircon, no fan. Somehow, we managed to get some sleep, although we often awoke from sweating profusely. When the power came back on early this morning, the aircon wouldn't come back on. Thus, once again, we have no AC. We have no doubt that after the New Year, Louise will arrange for the aircon guy to get it fixed. It's just impossible to get service over a holiday and we understand that service people want time off for holidays. Although at quite a distance, it was delightful to see so many giraffes and zebras together in the open field. Today's expected high is 37C, (99F) which although is hot, is not nearly as bad as it was days ago. We can manage this for the next few nights until we get service, hopefully on Wednesday. With a limited inventory of good photos, yesterday we took a chance and went out for a drive through the park. Our expectations were low. With fewer animals visiting us over the past two weeks due to holidaymakers infiltrating the park, we figured we would see much. At times, it appeared the two species were interacting. On a few occasions, we embarked on our usual drive only spotting impalas who are easy to find at any time. Their prolific numbers and sturdiness keep them readily available for viewing on the hottest of days and active regardless of tourist traffic. We took the shorter route, starting at Volstruis Road where we often find ostriches. As mentioned in earlier posts, Volstruis means "ostrich" in Afrikaans. Ironically, that's where most of the ostriches in the park seem to hang out. Go figure. Playfully interacting with one another. At that point, if all we could get was ostrich photos, we wouldn't complain. Ostriches are other animals that don't seem to care if there are tourists in the park or not. They proudly walk about as if they own the place...maybe they do. Once we approached the intersection of Volstruis Road and Hornbill Street, yep, we saw ostriches as shown in today's photo. From there we drove a few a little further to behold a scene unlike any other we've ever seen in Marloth Park. Zebras and giraffes sharing the same space in the parklands. In an open field, part of the parklands, we spotted no less than 17 giraffes with youngsters and at least two dozen zebras including their recently born offspring. It truly was a sight to behold... a menagerie of animals co-mingling in the same space with no concern whatsoever as to one another's presence. They occupied an area equivalent to a long city block and we held our breath in total wonder of what lay before our eyes. Zebras and giraffes at a distance. Sure, I wish we'd been able to get better shots but we were on the road and they were in the center of a large open field. But, that fact didn't keep us from trying to get a few good shots to show here today and more to share after the New Year, most likely on Wednesday. As mentioned above, tomorrow we'll be back with a "Year in Review" post with some of our favorite photos, including some from Antarctica and Buenos Aires, both of which occurred in 2018. Ostriches don't seem to mind what's going on the park. They are easily found near Volstruis Road. May your New Year's festivities be joyful, festive and safe and may the New Year bring you all the riches you so well deserve. Happy New Year to all! Tom's monstrous meal from a great barbecue place in Palermo, Buenos Aries. I ordered the guacamole for my salad and ate all of his sugar-free coleslaw. For more photos, please click here. Stunning wildlife from five years ago today...Another entertaining dinner in the bush..
Five years ago today, a Big Daddy came to call at the Hornbill house. The family of nine warthogs stopped by almost every day. The other mom and one more baby were off to the side when taking this photo. The babies love looking at us almost as much as the moms. Each time they arrived, we take a head count ensuring all nine are still there. Five years ago on December 30, 2013, we posted all of the photos included here today. The story we wrote, which may be found here, revolved around some of the hardships one may experience living in the bush while reveling in the extraordinary experience of living among wild animals. In reviewing this old post we realized how much we've changed over the years and how much more tolerant we've become, not only in Marloth Park but throughout the world as we continue in our travels. 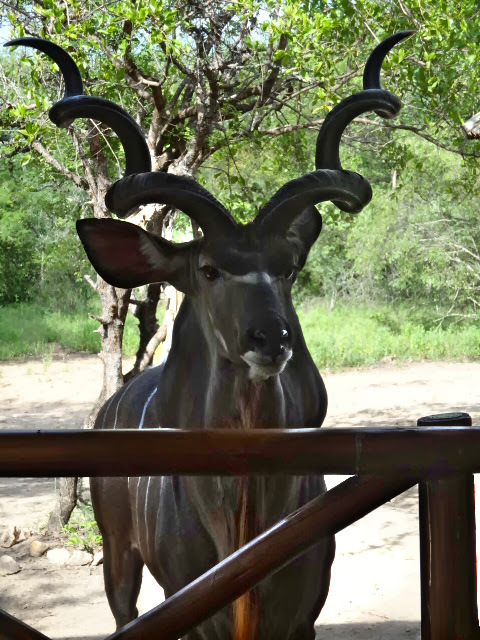 I took this up close male kudu photo while standing behind the railing of the veranda at Hornbill. We never give gecko poop a single thought; we now love the rain (for the sake of the wildlife's source of nutrition); we don't mind cloudy days based on the prospect of rain; the insects don't bother us so much anymore; we pay no attention to the bumpy roads other than to navigate them without damaging the rental car; and, we've learned enough about the wildlife and precautions we must take to ensure ours and their safety. However, we still experience frustration over power outages especially during periods of extreme heat. That situation results in losing sleep and feeling awful during the heat wave. This is the mineral lick we'd purchased at the time for visitors that was recommended by the Rangers as an excellent adjunct to the visitor's natural diet of greenery. The kudus were the only visitors that seemed to like it. The others sniffed and walked away. We'd hoped this would attract wildebeests, which at that time had yet to come to the garden, only running through on one occasion. Today, the third comfortable day in a row, the temps are staying well below the previous 40C, (104F) and higher and the cooling breeze provides a considerable amount of comfort. The expected high for today is 35C, (95F) which we can handle easily without using aircon until bedtime. Speaking of aircon, Louise texted me this morning to ask if it was working. She'd contacted the aircon repair guy, Louis, but wasn't certain if he'd been here or not. Much to our surprise, it worked when we tried it. Whether it reset on its own or Louis fixed it, we don't know at the moment. At least it's working as long as we have power. We'll see how that goes as it heats up again. This same warthog from five years ago may still be in the park. Warthogs have a lifespan of up to 15 years. So far today, we've had a few more visitors than we've seen in the past 10 days, making us think that perhaps some of the holidaymaker crowd may be thinning out. So far, we've had two bushbucks, nine kudus and two warthogs, one of which was "Little" of course, all of whom we fed with enthusiasm. Last night, while driving on Oliphant, the paved road, while returning from another excellent dinner for nine of us at Jabula Lodge & Restaurant, Rita and Gerhard turned on their flashers to alert us to something on the road, a magnificent highly venomous puff adder snake, as shown in our photo below from when we attended "snake school." Puff adders are commonly seen in Marloth Park. This photo was taken while we were at snake school in March. Click here for the link. We'd love to have been able to take a photo but it moved so quickly there was no time to turn on the camera and get the shot from the car. None the less, we were quite excited as we're sure Rita and Gerhard were as well. As for the evening at Jabula Lodge & Restaurant, it couldn't have been more enjoyable. Three of Don's cousins; Lorraine, Mike, and Hugh, joined the six of us (Kathy, Don, Rita, Gerhard and Tom and I) and the conversation was outstanding. The nine of us were seated at a long table on the veranda, the same table where we'd had my 70th birthday party last February 20th. It's hard to believe that was so long ago; 313 days or 10 months and 10 days ago. Hanging out upstairs in the loft with aircon from a much-needed break from the awful heat, we took kudu photos from the second-floor veranda as he looked up at us. "How about some pellets?" he asked. 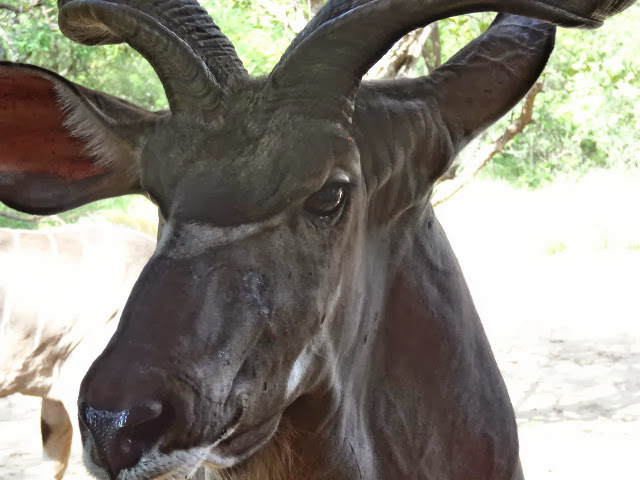 Kudus can weigh as much as 317.5 kg, (700 pounds) or more. Now as we look to the future, we're equally surprised by the fact that we'll be leaving Marloth Park in a mere 46 days. How the time has flown! And now, with only about one week until the park crowds thin out, we're looking forward to the immediate future and the return of our wildlife friends. Tom's burger with ham, eggs, cheese and beef with fried potatoes on this date, one year ago. For more photos of Palermo, Buenos Aires, please click here. A single bottle brush flower blooms in the bush. Tom took this photo of two hadeda birds on the roof of a neighboring property. Click here to hear the sounds they make, which resulted in their name. They are known as the loudest birds in South Africa. No words can describe the relief we're feeling after the temperature has dropped after the rains of the past 24 hours. Currently, at 10:00 am, its a comfortable 25C (77F). What a pleasant surprise for Tom early this morning! There were three duikers, one male and two females and two female bushbucks in the garden sharing pellets. Although the aircon in our main floor bedroom won't be repaired until after January 1st, if it stays this cool for the next few days, we'll manage just fine. if it heats up to 40C (104F), we'll be back where we were when the power went out when the company can't handle the extra load of holidaymaker's use. A number of locals have made comments on various Marloth Park pages on Facebook such as "We wouldn't lose power if you idiots don't use aircon when it's hot." This is a male giraffe due to the lack of hair on the ends of his ossicones. the pointy protrusions atop his head. The hair has worn down from competition for dominance with other males. But, the reality is, people will use aircon when temperatures are so high. Many people living and visiting Marloth Park are seniors, those with health problems, children and everyone in between. Male elephants are excluded from the family during their teenage years to live and fend for themselves. This is done to preserve the integrity of the gene pool and prevent the male from mating with his siblings and other female relatives. When the temperature is over 40C it's highly unlikely anyone will be willing to sacrifice being cool, at least at night, when sleeping is nearly impossible. It's a catch 22. Plus, you can't single out healthy mid-age residents to avoid using aircon so others less fortunate may use it. That's not going to happen. Thus, with high temps in Marloth Park right now, the power goes out. Plain and simple. At times, we'll see two or more males hanging out together. It should become easier within a week when many holidaymakers leave the park after New Year's Day. By January 9th, we should be back to "normal" with sufficient power to handle the park's needs in most cases. When we spot a herd or "parade" of elephants it is often comprised of a matriarch, moms, offspring, other females who've yet to give birth. and young males who've yet to be ostracized from the family. That's not to say we'll be free of outages. Load shedding is supposed to continue in January but right now the Eskom website states, "We are currently not load shedding." We'll see how that goes. Last night, I had a great night's sleep. Although we both awaken many times during the night, I easily fell back to sleep, getting a full eight hours of rest. I feel like a new person. Tom, on the other hand, was out of bed by 6:00 am and may need a 20-minute nap today. Last night, we decided to go out for dinner and we showed up at Jabula Lodge and Restaurant without a reservation although a group of nine of us will be dining there tonight. I was so tired I couldn't imagine putting a meal together. A male lion perusing the area near the Crocodile River. With the fabulous restaurant totally booked, we knew we'd be willing to eat at the bar rather than request a table. We arrived at 1700 hours (5:00 pm) and by 1930 hours (7:30 pm), after another wonderful meal, I was ready to head back to our house. Tonight, Kathy and Don and three friends/family members and, Rita and Gerhard will join us for dinner as mentioned above for what surely will be another enjoyable evening with friends. A male lion on the move. As for today, if it doesn't rain, we'll try a drive in the park, hoping to spot some of our wildlife friends. If there's too much traffic along the river, we'll turn around and come right back. This place is all about low stress and a powerful sense of calm. We'd prefer to keep it that way. Have a peaceful and calming day! Tom ordered a local beer while I had a Malbec at La Cabrera Restaurant in Palermo, Buenos Aires, Argentina one year ago today. For more photos, please click here. This is a younger wildebeest who visits on occasion with what appears to be his dad. We call them, "Dad & Son." Little's stopped by a few times today including during the pouring rain. We love this house in the bush. We love living in the bush. The wildlife, the people, it's all beyond our greatest aspirations of spending time in Africa. But, with it, there are some challenges, for which we're making every effort to stay upbeat and positive. The hardest part has been not sleeping for the past two nights when the power was out for 12 hours each night, the first night beginning at 2100 hours (9:00 pm) and the second-night beginning at 1930 hours (7:30 pm). In the past 18 hours, we've only had power for less than three hours. If it hadn't been so hot, it wouldn't have been so difficult. But with no screens on the windows, no breeze whatsoever and daytime temps in the 42C (107.6) with high humidity with nighttime temps only slightly less, sleeping was out of the question. Big Daddy eating pellets off the veranda's edge. Twice during the past two nights, we each took cold showers but even the water temperature wasn't cool enough to do any good. Within minutes, we were soaking wet in sweat once again. I don't recall any time in my entire life that I sweated so much. After each shower, I had to load up again on insect repellent that works great without DEET but is sticky and smells awful. It almost wasn't worth taking the showers. It's easier for male kudus to eat this way as opposed to bending down with those giant horns. Wildebeest Willie waits in the background for his turn. I'd considered the possibility of our leaving to stay at a hotel until the crowds in Marloth Park thin out and less power is needed to accommodate the additional power usage. Tom wasn't enthused about the costs for spending on two rental properties simultaneously when we have huge payments upcoming in the next two weeks for future cruises and the final payment on the Kenya tour. I get that and didn't press the issue. Finally, Willie inches his way into the pellets on the ground. For the heck of it, I checked online and there wasn't a single room available outside Marloth Park during the next week or two. After all, it's still the holiday season which here in South Africa doesn't officially end until well into January. My research was pointless. The aircon in our main floor bedroom has officially died. No matter what we do, it won't turn on - new batteries in the remote - resetting the electric switch when the power is back on temporarily - nothing works. At times, there are scuffles over dominance. If we have power tonight and it's still so hot, we'll have to sleep upstairs for working aircon. But, that's not the problem. Most likely, we won't have power. As soon as everyone in Marloth Park turns on their aircon, the power goes out. There's just too many people here. We've heard that some holidaymakers have left due to the power outages and the heat. Whether or not their landlords/property managers have given them any type of refund or credit remains to be seen. It rained for a few hours today bit not long enough. I suppose all Marloth Park rental agreements should have a clause stating, "It is possible, if not likely, that during your occupancy, the power, Wi-Fi services, and/or water services may be interrupted from time to time. No refunds will be provided in the event of such occurrences." After all, this is Africa (known as TIA) and stuff happens here which may rarely occur in one's home country. Its the price one pays to partake of the many wonders this continent has to offer, experiences that dreams are made of. Each time it rains the bush gets greener with life-saving vegetation for the wildlife. And, as hard as it is right now to sleep and to bear the heat during the days, we have the time to look forward to when the holidaymakers leave and everything is right with the world once again. Instead of counting the days until we leave, I'm counting the days until they leave. If predictions are accurate this should be around January 9th - 12 days and counting. This is exactly what we posted one year ago today: "The entrance to our new vacation/holiday home we'll be renting in Marloth Park beginning on February 11th, aptly named "Orange...More Than Just a Colour." For the link to this listing, please click here." For the entire post, please click here. Oh, what a night!! !...Not so good!...But, it's Africa...What did we expect?.. Youngsters of varying ages comprise an integral part of the elephant family. This photo was taken five years ago on this date when for the first time, we discovered oxpeckers and why they land on the bodies of certain wildlife. For more on this post, please click here. Note: Based on a lack of sightings these past few weeks, many of today's photos were taken over the past few months. For the month of December, we expected exactly what we've been given; power outages; heat; humidity; tourists; lots of bees, flies, mosquitos and other insects; and fewer animals in the garden than at other times of the year. Elephants coming down the hill to the river. But, when face to face with these types of challenges, our former expectations provide little relief or comfort. When yesterday's temps reached 43C, (107.4F) and the power went out at 2100 hours (9:00 pm) leaving us in a bedroom with no screens and not even a fan for relief. We both drifted in and out of sleep throughout the night, laying atop the top sheet and comforter. I can't recall the last time I slept without at least a sheet covering me. They made it down to the river to cool off. I spent most of my waking hours playing solitaire on my phone with the screen dimmed while continually aware that the battery was rapidly losing its charge. By the time I rolled out of bed this morning, sweaty and exhausted there was a paltry 10% left. Thank goodness it made it through the night. We try to avoid taking photos through the fence between Marloth and Kruger Parks but its often unavoidable. Showering in the dark bathroom this morning even left me hotter and more sweaty. My phone wouldn't work to call Louise for a power update. Oh, good grief. So, we decided to drive to her house to see what she'd heard about the outages. Before we headed out the door, John, the Wi-Fi guy appeared at the prompted by a thoughtful call from Louise and a short time later we had both electricity and Wi-Fi. Dad ostrich and one growing chick. At this point, we realized we'd better get to Komatipoort to do our shopping or the crowds would be outrageous later in the day or tomorrow. With the upcoming New Year's Eve party on the horizon, we needed to shop for ingredients for the dish we'll bring to share. It was a good thing we grocery shopped when we did. As we drove back out of the small town when we were done, the roads were already backed up with holiday shoppers and locals preparing for the upcoming New Year's Eve celebrations. The dry ground seems to offer little in the way of nourishment but somehow they manage to find enough food to sustain their growth. While shopping we ran into Kathy and Don who informed us they'd love to join us (and Rita and Gerhard) at Jabula Lodge and Restaurant on Saturday evening adding three more friends to our already booked party of six. Now, we'll be a party of nine. I notified dear friend/owner Dawn to see if nine will work during this busy period. Most likely, she'll find a way to make it work. Back at the house by noon, we unloaded the groceries and finally, I had a chance to sit down to get to work on today's post. In the continuing heat, I wondered if I could muster up the energy to get it done before too late in the day. The hot weather has a way of slowing us down. A darkly spotted giraffe sitting in the bush taking a break from standing on her long legs all day and night. We lost some food overnight during the 12-hour power outage but not too much since it was time to shop again. We tossed it all away and Vusi removed the garbage a short while ago. Rotting food certainly gets stinky in heat such as this. This morning when we pulled into the driveway we noticed Mom and Baby warthogs, four to be precise, sitting in the cement pond. What a delight it was to see them here. A lone female bushbuck was lying in the shade at the edge of the garden, trying to stay cool. We can only imagine how hard this heat is for our wildlife friends. Hopefully, tonight more will visit when we sit on the veranda while watching and waiting. We found these colorfully painted buildings interesting and befitting the somewhat flamboyant nature of Palermo, Buenos Aires. For more photos, please click here. Me, Tom and Kathy during the cocktail hour before dinner. A hippo on the banks of the Crocodile River as seen from Kathy and Don's third-floor veranda last night. To say today is hot is an understatement. With humidity ranging from 50% to 60% and temps as high as 43C (109.4F), it's relatively unbearable. Every so often, we come inside to recover in the bedroom's aircon for a few minutes and then head back outdoors to sweat some more. As always, Kathy and Don's spread of good food was delicious and easy finger food for Saturday night's cocktail party. Last night, at Kathy and Don's delightful Christmas night dinner, we made the best of the heat and had a superb evening. The food, the decorative ambiance and the lively conversation among the six of us (including Rita and Gerhard) continued well into the evening. The views from their third-floor veranda are spectacular. Finally, we excused ourselves to head back to our bush house in order to call our kids, grandkids and other family members to wish them all a Merry Christmas. Kathy and Don do a tremendous amount of hosting guests and always do so aplomb and ease. When we entered the car after 2200 hours (10 pm) it was still 35C (97F). Our clothes were soaked in sweat but the chatter amongst friends kept us delightfully distracted and we hardly noticed that fact throughout the evening. Last night's Christmas Day dinner was at Kathy and Don's home once again. 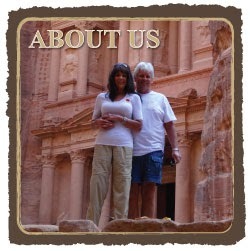 There were six of us, including Rita and Gerhard. As always, it was wonderful talking to our family members. With the time differences and everyone's busy schedule, we don't always talk as often as we'd like but with Facebook's easy back and forth, we never feel as if we're that far away. The "pie day from hell" resulted in this pinwheel-looking pie when it was impossible to handle the piecrust dough in the heat and humidity. Don said he loved it although it wasn't pretty. By the time, we both finished with the Skype calls, it was nearly midnight and much to our surprise we both had a good night's sleep. Thank goodness the power was still on. Five years ago we had no power in Marloth Park on Christmas Day. Gerhard, Don, and Rita were busy mashing the ingredients in their drink, called kawa, a Kenyan tradition that requires mashing the ingredients together. Luckily, the power shedding hasn't been excessive in December (thus far) and we'll see how it goes for the remainder of the month and into January and February when we depart on Valentine's Day to head to Nelspruit for our last night in South Africa, to be spent in a hotel for our early morning flight to Nairobi, Kenya. A Merry Christmas hippo on the river's edge. With the outrageous heat, we don't have big plans for today. We have homemade pizza left for Tom and I'll have hake (fish), cauliflower and salad. This morning I already prepped the vegetables and salad and put together the leftover ingredients to make one last pizza. They had a few visitors while we were there, a few zebras and a wildebeest. As we reflect on our wonderful Christmas season we're still reeling over how grateful we've been for all of our friends who made this time of year (and all year-long) so special for us. Kathy gave them pellets and they stayed around until the last one was eaten. This week will be quieter than last. On Saturday, we're dining at Jabula Lodge and Restaurant with Rita and Gerhard, and possibly with Kathy and Don and others before they take off to return to Pretoria. We hope to see them again before we leave. We'll be attending a New Year's Eve party in the bush when attendees bring starters and snacks and beverages of choice. We already know many of the party-goers and much to our pleasure Rita and Gerhard are also included. No doubt, this will be one more good time in the bush. Don had placed various flags around their property including this US flag. Tomorrow, we'll head to Komatipoort for a few grocery and pharmacy items. We won't need to purchase pellets since we've had so few visitors over these past few days and currently we still have five 40 kg (88 pounds) bags. Hopefully, in a week or so, our usual visitors will return when the holidaymakers begin leaving the park. Have a pleasant day after Christmas! The Feria de Plaza Serrano outdoor market is open weekends and holidays from 10:00 am to 8:00 pm. For more photos, please click here.